Who's Afraid of Virginia Woolf Event homeBuy ticketsCustomer reviews HamiltonThe PromNetworkTo Kill a MockingbirdKiss Me KateHadestownOklahoma! Laurie Metcalf and Eddie Izzard lead the cast in a starry revival of the Edward Albee classic. Why See Who's Afraid of Virginia Woolf? The official venue for this production is still to be announced. We'll update this webpage as soon as we know what it is. Metcalf, Izzard, Tovey and Ferran! 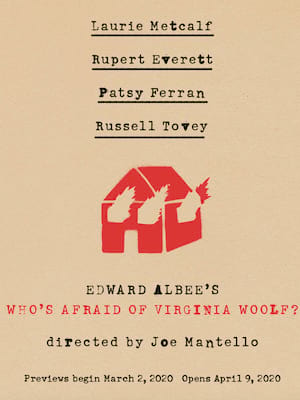 Edward Albee's theatrical titan, Who's Afraid of Virginia Woolf returns to Broadway with a whole host of award-winning stars leading the cast. Two-time Emmy Award winner and comedian Eddie Izzard joins Tony winner Laurie Metcalf (A Doll's House, Part Two) in this intoxicating drama. Originally debuting in 1962, Albee's double award-winning masterpiece has become one of the globe's most iconic plays. 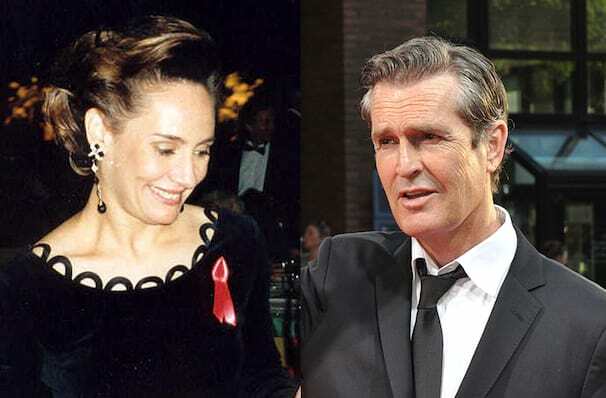 Having enjoyed a feature-length film adaptation, as well as several revivals (the most recent of which ran in 2012) Who's Afraid of Virginia Woolf is a scorching portrait of a disintegrating and dangerous marriage. Directed by two-time Tony Award winner Joe Mantello, this 2020 revival will also star British favorite Russell Tovey and 2019's Olivier Award Winning actress Patsy Ferran. What is Who's Afraid of Virginia Woolf about? After a party at the university where each of them works, George and Martha arrive home with a younger couple, Nick and Honey, in tow. Invited by Martha and to the chagrin of George, what starts out as intriguing observation soon sees Nick and Honey drawn into Martha and George's terrifying dynamic. Now in the middle of a marital breakdown, this unlikely quartet are heading to the battlefield, who will survive? Seen Who's Afraid of Virginia Woolf? Loved it? Hated it? Sound good to you? Share this page on social media and let your friends know about Who's Afraid of Virginia Woolf at Venue To Be Announced.